Should I replace my rusty manifolds? I am in the process of getting quotes to replace my heavily corroded exhaust manifolds. The flanges are complety wrotten, and the fixings are in terrible shap. My question is this. Should I bother? What is the worst that can happen if I just leave it? It's not blowing, and it's pretty solidly rusted in place. 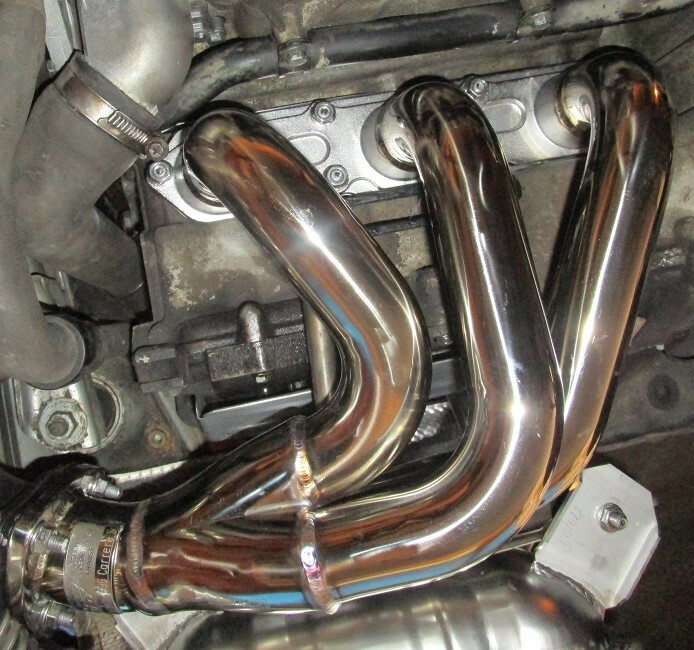 I do like the idea of nice shiny new manifolds, but I'm not really sure what difference it will make and if it is worth the £1,000+ it is likley to cost. I would wait until something needs doing on it. That is the plan with mine anyway. If your car is a keeper then you may want to bite the bullet. My car is better after doing them. Used the Top Gear ones. The biggest bill was the labour and GCR took pity on me and only charged me the estimate (which was eye watering enough). Every bolt snapped. Leave it, might never happen, they can look really really bad and not leak. Do it now so you are not left in the middle of France with a 996 that sounds like a tractor. Has anyones got so bad it has leaked this badly? When I do get around to mine, I'll be buying/borrowing a jig and buying the finest, sharpest drill bits money can buy. ng on your back with swarf in your eyes, then 2 months later a head needs to come off anyway for something else. Or you drop the engine for something else and put it on a stand. Then you will be cursing not being able to do it on the bench. Mine is staying put until it leaks (if it ever does). Mine doesn't look pretty, personally I'm leaving it alone until it starts to blow. Plenty of other higher priority jobs on mine. If it were me, I'd leave them until they need doing. New ones do look smart though. the £1,000+ it is likley to cost. Where you getting it done - Harrods? Cost me £356 for parts and labour. I'm guessing he's including the price of having his bolts all drilled out which can easily reach £500 so £1000 all in isn't far off of what one might expect. If all the studs come out in one piece then it isn't a challenging job. I'd leave it. Mine are a mess and look terrible but I'm going to leave it until it really needs doing. Far more things to spend the money on! I'm guessing he's including the price of having his bolts all drilled out. Exactly how I've treated my wife for 13 years. If there was an option for .. Good God Dont Touch It Unless You Have To ... then i would have voted for that !! Its rusty .. it dont look pretty .. short of getting run over by the car or its on a ramp then whos going to notice . I see shed loads of mainifolds in a poor condition .. i can count the number of times ive seen an exhaust leak from them on one hand ! They have to come off to do certain types of work .. they have to come off if you are modifiying the exhaust .. if none of these then dont bother .. probably plenty of other areas you could spend the money on . Flange gaskets and bolts can be replaced .. thats not a problem as you dont need the mainifold off to do that . Those manifold bolts are like ingrowing toe nails. The sooner it's addressed, the easier the pain. You're just ramping the bill up leaving it. The clue's in the name - Stainless, not Stainproof. Thanks Alex. I'm not that good with stuff like that. Can I get bolts that don't corrode? The new ones already have surface rust.